In our training around mental health awareness we use a very simple model, a bucket, to describe our relationship with pressure and stress. Into that bucket go all our worries, from any and all aspects of our life. If we can keep them in our bucket we are managing, if they start overflowing our bucket, that is when we are getting into difficulty. It is a very simple model. Three factors will determine whether or not that overflow happens, the size of our bucket, the amount coming in and how good we are at letting it out. I had one of those moments over Christmas. It was a few days after the 25th but family celebrations had rolled on and so I was several days in to a regime of eating and drinking too much and sleeping way too little. Nutrition, alcohol and sleep are three of many factors that will determine the size of our bucket at any one time. My bucket was small. Several months earlier I had been in a car crash. I was stopped at lights when someone rammed into the back of me and wrote my car off. The insurers provided a hire car (and some physio for the whiplash). On one of the days post Christmas the insurers phoned to say they wanted the hire car back. I had booked to take my eldest daughter back to her year abroad in France the following week and just got into a blind panic about the desperate urgent need to buy a new car, any car, that day, a Sunday, when there aren't many cars around to buy and my insurers were not open to agree insurance on whatever jalopy I managed to find. I spent several hours trying to resolve these multiple stresses before having to concede I couldn't. Turns out, several weeks later, I still don't have a new car, the sun still rises each day and the world still turns, and I took Steph to France in a nice smart hire car that I paid for myself - but for those hours that Sunday that degree of perspective and logic was way way beyond me, my bucket was overflowing. And although the festive food and wine was a contributor to that, I know very well that sleep was the biggest factor. Sitting in my pile of books to read, and now almost finished, was Why We Sleep by Matthew Walker. It is the most informative, incisive, inspiring book I have read in such a long time. Walker is a sleep scientist. 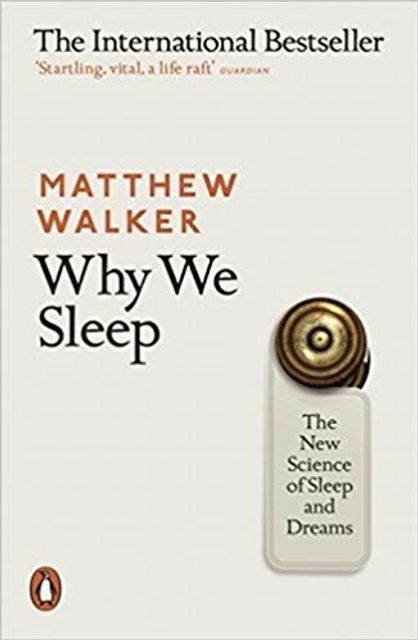 Drawing on his own work and that of numerous colleagues from around the world over many decades, he explains in easy to understand ways what happens when we sleep and why it is so important to our overall wellbeing. And then decries the impact of modern lifestyles and how we are damaging ourselves, our businesses, and most importantly, perhaps, our children, by our cavalier attitude to sleep. I am not going to try to summarise those impacts in a blog. I could not do the book justice. But if you do not get enough sleep, and enough of the right kinds of sleep, you will not be able to learn or remember, you risk mental illness, your chances of dying early from a whole range of physical illnesses, including cancer and heart disease, increase significantly, you under perform in every aspect of your life, you become less attractive, you are not a nice person to be around and you are very far from happy. Put the other way, if you want to be the best you, then sleep is the best solution and it is free! Understanding sleep and the different requirements we have at different stages of our lives, will also enable us to be better parents - who knew that teenagers are genetically programmed to go through a phase where their body clocks keep them up later than their parents, to give them time to explore being independent while still in the relative safety of the home, but then they will need to sleep longer in the morning - and by trying to bully them out of that, we will fail, and all we will do is leave them sleep deprived? 50% of young people diagnosed with ADHD, apparently, in fact have sleep problems which are the cause of the behaviour wrongly diagnosed as ADHD. Eight hours, every night. And if you miss some one night, you have missed it forever - we cannot catch it up at the weekend. Read the book, it will change your life! You might also want to get my colleague Uxshely in to do some training around this and help people with the behavioural change techniques required to make a difference in our tired lives. Scientists have discovered a revolutionary new treatment that makes you live longer, enhances your memory and makes you more creative. It makes you look more attractive. It keeps you slim and lowers food cravings. It protects you from cancer and dementia. It wards off colds and the flu. It lowers your risk of heart attacks and stroke, not to mention diabetes. You'll even feel happier, less depressed, and less anxious. Are you interested?